This cheat sheet is designed as a helpful guide for Treehouse's Build an Android Crystal Ball App project and other basic Android development. Tips for using Eclipse, the recommended IDE for Android development, are also included. The Android developer site contains fantastic documentation about everything you need to know to create Android apps. One of the most useful sections is the API Documentation. You can easily search for a specific API simply by Googling the Android class name plus " api" (ex. "Activity api"). The screen of an Android app is made up of two parts: the layout, which is how it looks on the screen, and the Activity, which is the Java code that controls how the layout behaves and reacts to user input. Eclipse includes a drag-and-drop Graphical Layout Editor to design and edit layout files. 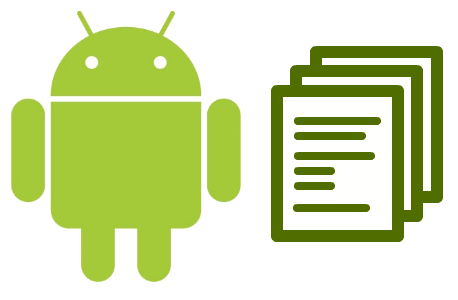 Layouts are encoded in XML and are stored in the res/layout directory of an Android project. Some of the basic layouts are as follows. wrap_content - Be as wide or tall as required to display the content of the view, i.e. wrap around the content. dp - Density-Independent pixels - Used for everything besides text. Takes into account the screen size and density to ensure uniformity across devices. android:layout_height="60dp" - Set a view to be 60 "pixels" wide. The actual number of pixels used will depend on the screen size and density. sp - Scale-Independent pixels - Used for text. Takes into account the screen size and density as well as the user's preferences for text. android:textSize="32sp" - Set the text to be 32 "pixels" high. The actual number of pixels used will depend on the screen size and density as well as the user's preferences for text. Activities are hooked to layouts, and their code is called when events occur. Events can either be a part of the Android Activity Lifecycle (such as when an app first starts, is interrupted by a phone call, etc. ), or by user input, like a tap or swipe. Activity is a subclass of Context, and Context is king in Android. Context has a lot of useful methods that are consequently available in the Activity class, too. The onCreate() method is called when the Activity is first created, i.e. when starting the app or navigating to a new Activity. In each lifecycle method like this, you almost always want to call the method from the parent class, like in line 02 of this example. The layout is hooked up by the setContentView() method, as shown in line 03. The Activity findViewById method is used to hook views from the layout to objects in code. In line 05 a TextView object named 'nameLabel' references the TextView in the layout with the ID 'nameLabel'. The res directory in an Android project contains the resources for an app like images, sounds, and layouts, among other things. Images and other visual files are stored in one or more drawable directories. If only in one directory, Android will scale the image as needed. If more than one directory is used, Android will select the appropriately sized image. XML files can also be written and stored as drawables. These kinds of files can control when multiple images are to be used based on the state of a view, or other visual settings like gradients, borders, etc. String values in Android are typically stored in a separate file called strings.xml in the res/values directory. This allows the Strings to be defined in one place and used throughout the app, and it also allows developers to swap out entire files for different language versions. Raw audio/video resource files can be stored in the res/raw directory. These can include things like mp3s and mp4s. The tag is used to denote where this message was logged (typically the name of the class). This is useful for filtering messages in the logcat view. The message is the information to be written to the log. The log is viewed using the logcat view, which is available in Eclipse or as a separate app you can install on your device. The logcat view can be filtered by things like the tag or text to search for. The first parameter of makeText() is the context. The keyword this can be used inside an Activity. The second paremeter is the text to appear in the Toast notification, and the third parameter is the length of time (in milliseconds) before the Toast disappears. You can run an app in an emulator (Android Virtual Device) or on an actual device connected via USB. Click on the Run button in the toolbar or right-click on a project in Package Explorer and select Run As > Android Application. Running an app will launch an appropriate emulator if none are already running. Add breakpoints in code by double-clicking in the gutter next to the line where you want the breakpoint set, or by selecting Run > Toggle Breakpoint. Start the debugger by clicking on the Debug icon in the toolbar or right-click on a project in Package Explorer and select Debug As > Android Application. The debugger uses a separate perspective (called "Debug"). For a quick overview of some of the basic Java concepts necessary for Android development, check out the series of blog posts on the Treehouse blog starting with Java Basics for Android Development - Part 1. For member variables in classes, an access modifier controls who can access the variable. A method is a section of code that we can call from elsewhere in our code, and the method will perform some action or return some kind of result that we can use. Arrays are structured lists of pieces of data where each piece of data is referenced by its position in the array. String favoriteColor = colors; // favoriteColor will be "Red"
Java code is typically organized into classes and packages. Classes contain pieces of data (member variables) and methods. Packages are simply groups of related classes. Without the cast to (Button), this line of code tries to force a View into the myButton variable, which will result in a compile-time error. Comments have no affect on how the code runs. They are there for reference when you or another developer is reading the code.